Evolution Funding has been identified as one of London Stock Exchange Group’s ‘1000 Companies to Inspire Britain’. The report is a celebration of the UK’s fastest-growing and most dynamic small and medium sized businesses across the UK. Evolution Funding employs over 270 people UK-wide. 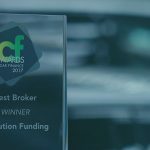 Their main brand, Evolution Motor Finance, is the UK’s largest point-of-sale motor finance broker. The firm also has a vehicle loans business, Evolution Loans, a vehicle rentals brand called EVOGO and a vehicle retail arm, Mike Brewer Motors.